If anyone is curious, this describes some aspects of my home network configuration. Unfortunately DSL is not available at my house. I have Comcast's standard cable modem connected to my router. Linksys WRT54GS running OpenWRT. This is setup with various wifi security and firewalling. It also has some nice QoS (quality of service) settings which I provide details on in my projects section. I'm using SunRocket VoIP service and their ATA (analog telephone adapter). I have placed it behind my router/firewall, and it is connected via ethernet to the router. Because I don't have DSL, I have no reason to be connected to the phone company's wiring that comes to my house. Therefore I have disconnected my phone wiring at the demarc point, and plugged the ATA into my home jack. This allows the ATA to ring phones anywhere in the house. Unfortunately, the cordless phones I have are in the 2.4 GHz band and interfere with my wifi when I'm using them. Additionally, my microwave oven interferes with both the phones and the network when it is running. Arrghhh. Because of these and other issues, I decided to wire my home for networking. This is an old AMD K6 box running Debian Linux. I put a 160 GB hard drive in it and I use rsync with hard links to backup its OS and the entire hard drives of my other machines onto this box. It uses LVM (logical volume management) to make it easy to add or remove disk space in the future. 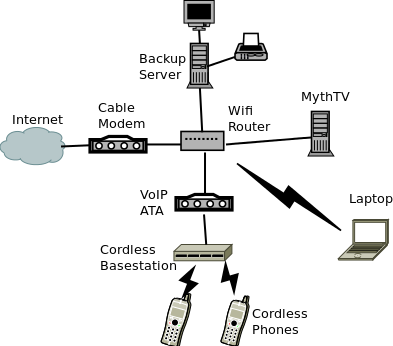 It is connected via ethernet to the router. I have a newer box with 512 MB RAM, a 60 GB drive and a 160 GB drive running MythTV on Debian Linux. It uses LVM (logical volume management) to make adding and removing disk space much easier. It has already been useful several times, especially when I added the 160 GB drive. This is the "master" server for my ripped mp3s, digital photos, and mythtv video. Everything is backed up via rsync to the backup server, except for the mythtv videos. They take up so much space and are not critical, so I don't back them up. It is connected via ethernet to the router. This is my main box which is now running Ubuntu Linux. I'm running LVM on it too to make it easier to reconfigure my partitions. When it is normally sitting on my office desk, I plug it into the router via ethernet. But if I take it elsewhere in the house I use 802.11g wifi. I back it up to the backup server using rsync.